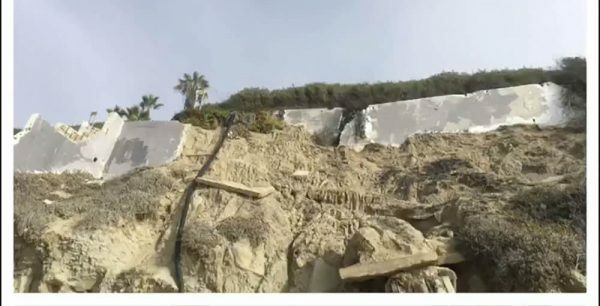 Two half-spheres covered with sky-blue and white triangles now grace what was once a graffiti-covered, gray cement retaining wall beneath the Cliff Restaurant near downtown Laguna Beach. Titled “Main Beach Mandala” by its creator, Jeff Lavinsky, they are meant to evoke dream catchers, a Native American construct. Now, the mural installed in recent weeks without the land owner’s permission has become a magnet for passersby, but also a source of controversy. Though the artwork is located on private property overlooking a public beach, neither city code enforcement officials nor the city’s cultural arts management sanctioned it. Last week, Lavinsky said he learned that code enforcement officials intended to paint out his work by Jan. 29 because it lacked a permit. The artist learned of the threat in a letter from Sarah Reid, a representative of the property’s owner and her mother, Naelda Merritt, of Porterville, Calif.
“Mandala” is safe for now since Lavinsky, albeit post installation, initiated the process of securing the required permit. Its fate is to be decided during the Feb. 12 arts commission meeting, he said. In an email to the artist, Reid said, “my mother was never contacted and asked if it was ok to paint the murals.” She informed him that Sian Poeschl, the city’s arts manager, let her know that authorization would be fairly easy to obtain and free of charge. Reid also expressed concern regarding the upkeep of the work, which Lavinsky agreed to undertake. She noted a second older mural, also unauthorized, is nearby. “We are ok with these murals; in fact they are very pretty. As I understand it you painted the geometrical one and another artist painted the other. We are in the process of finding out whether my mom is responsible for both of the murals or only yours, which happens to be on her property…” she wrote. The other painting is older, a representational piece by a different artist done on a separate slab of cement not located on the Merritt property. It rests on the sand below. 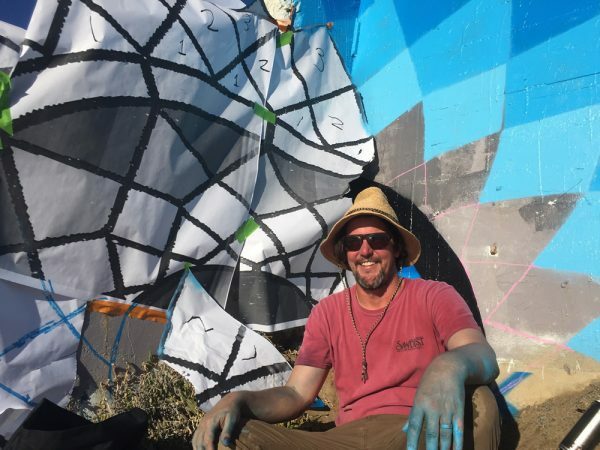 A Laguna Beach painter and four-year Sawdust Festival exhibitor, Lavinsky created his first mural in the city as a commission by local community activist and mural proponent Bruce Hopping in 1998. Located at St. Ann’s Drive, it featured whales and dolphins. “Then there were no permits, no problems,” recalled Lavinsky, adding that his work was eventually painted over by another artist. Lavinsky began “Mandala” late last year encouraged by Adam Casper, a local arts entrepreneur. 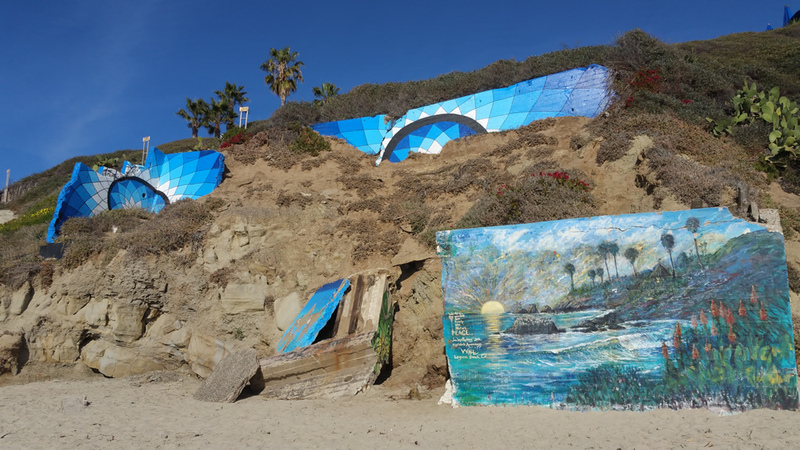 Casper coordinated approvals with property owners for two other ill-fated, non-permitted murals in Laguna in 2015; the “Charming” mural located on a North Coast Highway apartment building and the “Wonder” wall on a pet supply store. Both were created by British muralist Ben Eine. “Wonder” was painted out by a building manager within weeks of its completion and “Charming” painted over when the building changed hands in 2017. Casper and Lavinsky met at the Sawdust Festival and immediately hit common ground. “We both feel that it’s disturbing that murals are not readily tolerated here even though they have a place in this art colony. Perhaps it needs to be re-branded, and I am more than happy to help,” said Casper. The cement block walls before and after their transformation. Casper, a New York City native, has worked with renowned street artist-muralists such as the elusive Banksy. He also played a role in organizing two murals for the Sawdust Festival. “Heritage,” a Native American-themed mural by Roland Berry, commemorated the festival’s 50th anniversary and is now located inside the festival grounds. Last year, “Message in a Bottle” by the artist Bandit, focused on environmental ocean concerns. Meanwhile, Reid informed Lavinsky that “Mandela” likely will not remain in perpetuity. She predicted that the concrete wall will eventually be removed. “Perhaps at that time we can figure out a way to get it into your possession at a different location,” she wrote.